Many clients have described us as ‘a hidden gem’. Over the years, Guild Anderson has been privileged to have worked with many high profile customers who appreciate our discretion in business. By choice, we remain under the radar and are happy to stay that way to retain our high quality of cabinetry and creative design work. Our mission has always been to undertake a limited number of commissions each year, as this is what we believe ‘bespoke’ should mean. This way gives us the ability to focus fully on delivering the beautiful, well-made furiture our clients expect from us – on time and within budget (and this can be unusual in our sector!). With 80% of our business introduced from personal recommendation, this is an accolade indeed. Giving dedicated, personal attention to clients and the professionals we work with, is an attribute we look for in all our employees. Taking care to get things right, we feel, is the fastest, problem-free route to delivering the best that we can. 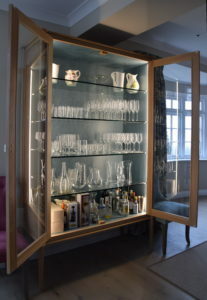 This cabinet (pictured) is one of our favourite one-off bespoke pieces – the individually turned legs in oak set at each corner, the internal lighting and the detail of the fabulous sea-green birds eye maple veneer – and is constructed specifically in proportion to the ceiling height and space around it in the room. Based between Shaftesbury and Salisbury, Guild Anderson have undertaken projects from Scotland to Ibiza, with the majority of our commissions are from what we describe as our ‘heartland counties’, of Wiltshire, Hampshire, Dorset, Oxfordshire, Somerset and Bath. 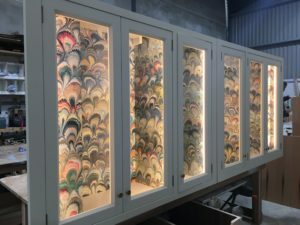 Our workshop makes bespoke kitchens and furniture to order from the Fonthill Estate in Wiltshire and focus on country houses of all styles and sizes. 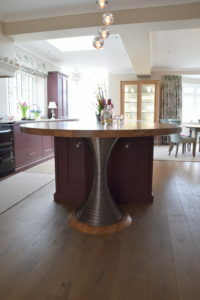 Commissioning a handmade kitchen or piece of furniture is both practical and a pleasure. Knowing you were a part of creating something that is not only unique but made in the proportions, materials and style to perfectly fit your home, is enormously rewarding. With fifteen years of design experience, Guild Anderson use traditional craftsmanship combined with modern practices to make furniture by hand that is both contemporary and enduring. We are not followers of trends, we have an individual approach and this is what appeals to customers. Our preference is to listen and evolve the design together. We don’t believe in a house ‘style’ for our furniture, but rather offer a collection of ideas and experience, supported by sound structural and technical solutions. For Guild Anderson, bespoke means bespoke – both in design and material – and this is something we feel immensely strongly about. This approach is the same for cabinetry for the kitchen as for a bootroom, pantry, study, wine cellar or any other room in the house. Does bespoke have to mean expensive? “The truth is that renovation works are costly even for a small project”, says Nick Anderson, owner and Head of Design at Guild Anderson Furniture. “However, the cost difference between an outstanding result and a regrettable one is far smaller than people appreciate. To create something original doesn’t have to be a fortune. Whatever the piece, though, it does need to be well thought out and to balance. This is the secret of good design.” For Nick, achieving the right solution for every customer is the company’s mission on each project.